OK, I'm back - with some comments on your data. Let me first say - MODE $06 reports are very helpful - but often not exactly in the manner one would expect. Most do not appreciate that they are a "ONE & DONE" snapshot of some current live readings 'right NOW', and saved condition of OBDII monitoring test that runs all the time (multiple runs may not show a change at all on them). Consider this in context of upstream O2 sensors. Their voltage swings from ~.1v to .9v all the time. So ANY reading between that passes. STILL, it beats the hell out of crawling under the truck and measuring voltage and current in the O2 sensor circuits. Or trying to hold meter leads on the Tank Pressure sensor while the PCM does an EVAP drawdown on the gas tank to see if the Gas Cap is sealing - to mention a couple. BUT, many expect something like "Replace _component X_ with a new one of part number "X" and perform a PCM relearn procedure". (Ain't gonna happen) We have take it all in a much broader context to derive its benefit. For example - ENGINE RUN TIME THIS DRIVE CYCLE? CATS AT OPERATING TEMP? HAVE ALL (OR WHICH) MONITORS HAVE COMPLETED [ NOTE: FF data PID 41=0 tells us NO monitor tests have completed ] - particularly significant here is Catalyst Monitor or EVAP monitor this drive cycle? (EVAP couldn't run anyway in your case [Note: FF data shows fuel level 90% and EVAP will not run unless it is < 75%] - EVAP state could be determined by Checking EVAPMODE PID, if that were a concern) . The Mode $06 report confirms the DTC P0304 and flashing CEL you report. Tests Monitor MID$a1 Test IDs $80 and $82 confirm Misfire Monitor general data over both 200 rev and 1000 revs has exceed the catalyst damaging ratio of 7.37%. (Your CEL has Flashed at you!!!). //// Important aspects of that: When it is occurring, and for a period after, the PCM shuts down 4 injectors at a time, alternately, in an effort to regurgitate fresh air through the engine to clear unburned gas out of the catalytic converters. MAKES IT SHAKES LIKE HELL!!! Not a miss. It's trying to save your CATS ///. Also confirmed by "Calculated" Midbed Catalyst temperature being 997.6º C (MID:$a1 TID:$84) where factory catalyst damaging temp is 966. (( So try hard to avoid situations causing the flash until you get the miss fixed )). Freeze Frame data is similar to the Mode $06 report - in that knowing lots about the surrounding environment can magnify its benefit. For example: I must assume 35º ambient realistic for your situs - at the time of last DTC, but you would know more about that than I. (If NOT, some simple sensor like that that becomes a parameter in PCM's calculation(s) for engine LOAD etc. could be something to monitor further). I do NOTE in FF data: Again - Catalyst temp is VERY HIGH at the time of the last DTC - (presumably that P0304, which would be expected). Another thing I NOTE in FF: Barometric pressure (from vehicle) = 15.084 psi. That is = (30.711 hg). [Sea level is 14.7 psi] Is your Expy under water - and I don't mean economically? But that is another thing that requires knowing more about environment than I. WA has elevations from sea level to 14,410, and it could have been a still, cool, humid day ???? IDK. But the PCM includes BARO(), and IAT, in its LOAD calculation which controls other things - such as - Cam Retard (effecting EGR diluting combustion intake with exhaust), Lambda and so forth which could 'aggrivate' misfires of the weakest link (Cyl #4 possibly). Other than those things, FF data seems to be fairly clean and normal for the surrounding conditions as I understand them. At this moment, I'm thinking I would keep a 'squinted' eye on ambient temp, BARO(), and MAF (which looks roughly ok in FF for 2.2k RPM). Next consider the post in my earlier response - keep in mind the 5.4L is VERY picky about ignition. Do "HOSPITAL CLEAN" plug change (NO greasy finger prints on plug ceramic), clean carbon out of plug wells beyond plug threads, NEW BOOTS a must, clean / stretch springs and COP contacts, little dab of dielectric grease on NEW boots, making sure ALL COP connectors are clean and snap in place GOOD. F150Torqued - thank you for the kind welcome and good memories. I plan to make your Great Rug Tool today. If I may say so, sir - your attitude towards tools reminds me of Robert Pirsig's point of view in Zen and the Art of MM. Could I ask you to send me me a good link to the TDC rotation instructions for our engine? My knowledge of my engine is still very limited. The app import filter did not like my text very much, it ignored some of the new lines or misread them. I ended up entering the values manually - please see attached .csv and the screenshot. The screenshot is taken today with the engine idling next to the garage. Thank you again for your time and the detailed analysis of my yesterday's Test Results. In order to reproduce the P0304, I grab my boat, go down to the nearest Puget Sound park (two miles from home), make a U-turn and have an miniature Snoqualmie pass testing ground which turns the CEL on every time. Yesterday was a real downer. The atmospheric pressure was probably Seattle-record low, my wife slept through the whole day - hence your good point about my vehicle running under water. ODB2 101 is in order, I do realize more studying is required before I can fully understand the information you have so kindly provided. I notice your Ford 5.4v3 Misfire Monitor.csv file has no C/R separating each line. IDK, but I think that would screw Torque UP on importing. You may have manipulated the file with Excel - who likes to do funny, funky, clever things. I realize a "CSV" file is often treated as an Excel file, and technically it is. But Torque wants a 'flat text file' with an extension 'csv'. Also - I try to avoid the period in the middle of the file name if that's the name you downloaded to your phone. Maybe this will help. 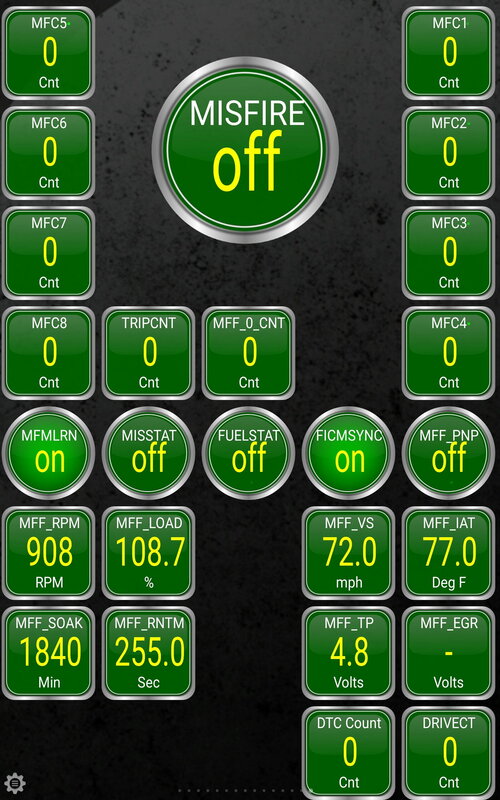 The file Ford 5.4v3 Misfire Monitor.csv I attached to my post is as-is copy of ./torque/extendedpids/monitor.csv on the Android tablet running Torque Pro (I did rename the file before attaching though). However, I think you are correct suspecting the CRs. Even though I would not touch a flat file with Excel, I did the editing in TextEdit (macOS) - it may have messed up CRs and LFs in your original text. All the initial problems notwithstanding, your dashboard is up and running on my tablet now. After I clean the well(s) per your recommendations, I'll keep on watching (and reading the OBD manual you have sent me). Could you give me a hint on how you rotate to the TopDeadCenter when you do the cleaning? Do you use a compression/vacuum gauge, or is it enough to watch a screwdriver go up and down? Come to think of it, I noticed that and now recall finding it strange when I backed up my entire .Torque/extendedpids file. Anyway - glad you got the dashboard working. I had all eight plugs out during well(s) cleaning and it rotated easily with a socket/ratchet on crank pulley - though only a couple clicks at a time. But that whole issue is of less importance using the "rag/wire/drill" red-neck tool with lacquer thinner or B12-Chemtool instead of a brass wire bottle brush. May be a little slower but we for sure want to avoid this: http://www.ford-trucks.com/forums/13...lp-piease.html A long shank screwdriver will reach piston and it's 'easy' to tell when piston is UP (whether exhaust or compression stroke - don't care for our purpose). You got a buncha' guys pulling for you here though. Between work, kids, disgusting weather (and lack of space in my garage) I may not be able to get the cleaning job done until the weekend. I do have your rag-wire-drill tool ready with some carb cleaners and a long screwdriver next to it on the workbench. While I admire your modesty about quick self-made solutions, imho this is a quality tool because it gets the job done with minimum hassle and low risk of unpleasant accidents. If you scroll my favorite book down to page 55, couple of pages will illustrate the point much better than I possibly could. The narrator talks about selecting the best shims for motorcycle handlebars. Since I do not have a meaningful progress report on my problem yet, I hope you and other guys find the discourse amusing. The rest of the book has a lot to say about Quality. You must have ran across my red-neck CAI. Wait till you do a timing job on you 5.4 and I got a couple of good tools (that you've got laying around) for that too! Liked the book reference. When I make my Catch Can out of a beer can, maybe we can author our own book. First, I am excited to have found this site. I have been chasing an open loop misfire for over a year with hesitation at heavy acceleration. I replaced plugs (none broke), COPS, injectors, fuel filter. I seemingly can't get the Torque Pro for iPhone, but I do have FixD. The only reading that is obviously screwy is long term fuel trim bank 1 - it runs around +20% while bank two stays in single digits. It runs ok cold for a minute or two then misfires always #8 sometimes #4, on rare occasion I get a lean code. Once I get almost midrange on temp, it clears up and runs smooth with only hesitation/misfire if I hit the pedal (not quite punch). I am considering using a Top Engine cleaner, but I am betting you'd recommend your method first - it does seem most posts here were dealing with misfires after warm (closed loop) so I am a little hesitant as I hate removing them for just the fun of it. Find all posts by PhilH. Well, It's a long story as most of us have had. This is actually my wife's truck, but it is my PROBLEM. Let's start by stating everything that has been done. Replaced Driver side Valve pan cover (PCV Valve located here), Intake manifold (plastic), All 8 injectors via dealer motorcraft part from VIN, All 8 spark plugs via dealer motorcraft part from VIN ( All 8 broke off used NAPA # 77-4021 tool to remove with no big issues), MAF sensor, both VCT solenoids, crank position sensor, and all 8 COP's (Coils). The only thing that isn't motorcraft is the COP's which are MSD. I am ready to SCREAM. I am a DIY'er but this is over the top. I have rebuilt several engines in my life, all 1970-1995 engines, and consider myself decent at troubleshooting and reading forums by learning from someone else's experience. EVERY item that has been replaced or procedure that has been done has improved the truck's running situation. I have experienced the lack of power, missing out at different RPM's, dying at an idle, noise at an idle, no vacuum (from the notorious hose on the rear of the manifold), and now I am having random misfires. I have not tried the "F150 Torqued" position on the cleaning the spark plug holes out yet, but will be in the next week, I hope. I live in Central / Southern Indiana and the temperature is dropping (low's in the teens and highs around freezing). The truck will not fit through my garage door with the lift and tires on it. Now about the truck: It is a 2006 F-250 with the 3V 5.4 engine. It just now has 71,104 miles on it (12 years old). It has 35" tires and 6" of lift and IMHO it has always been a "dog". I am very familiar with big tires and engine power, but like I said this is my wife's truck. I own a 2009 6.4 diesel with a spartan tuner with mostly stock sized tires,no lift, and no issues. So I am hopeful that "F150 Torqued" is absolutely right about my spark plug change and cleaning out the head holes. I will reply if that makes a difference, and I will reply even if it doesn't.